Wild Gears: a whole new experience for me! Wild Gears are developed by Aaron Bleackley of Vancouver. They are laser cut from acrylic sheets, and produced on demand. Aaron wanted more precision, size and versatility than the Spirograph(TM) sets provided. There are different shapes: triangles, squares, pentangles and more, available, and different sized holes allow for unusual parallel designs. This format provides many new and exciting possibilities. If you love Spirograph and are ready to take the next step, you can order your own, laser cut on demand by Ponoko. They’re not cheap, but they’re rocking my world. Ponoko doesn’t have an affiliate mechanism that can track sales from this website, so please let Aaron know that you came from SpirographicArt.com and bought a set, and maybe it will help me support my habit! You can reach him via the “Contact Designer” link on the Ponoko site. Find Wild Gears on Ponoko. 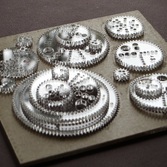 Any Bruton used one of the cardboard boxes the Wild Gears ship in and used putty to adhere the gears to the inside of the box, arranged by size and labeled. Neat, inexpensive idea. A rainstick made from the bits of acrylic left over when unpacking Wild Gears. From Suze in Australia. Jay Heyl shares a trick he used to help keep the gears in contact with the paper. 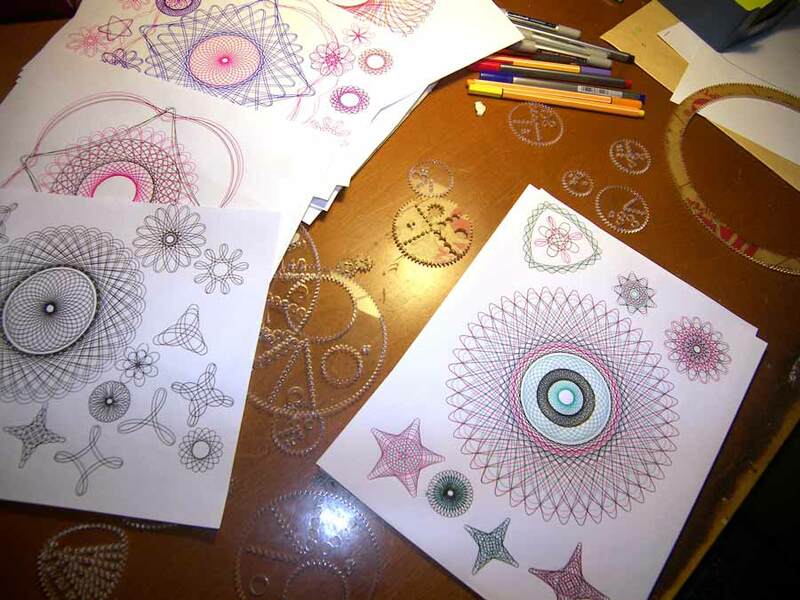 This probably wouldn’t work with Spirograph, just Wild Gears.